For Dr. Milan Radovich, the promise of personalized medicine isn’t some broad scientific concept. It’s the goal of more tailored treatment for each of the many breast cancer patients and advocates whose photos hang around his office — people who participate in his studies, visit his lab, or post on his team’s Facebook page to champion their progress. Radovich, an assistant professor at the Indiana University School of Medicine, focuses on triple-negative breast cancer, a diagnosis that is generally paired with a poorer prognosis than that of other breast cancer types. He uses next-generation sequencing and genomic studies to learn more about this cancer, which in reality is a catch-all for several different forms of cancer. With RNA and DNA sequencing, he aims to unravel the subtypes included in the triple-negative breast cancer category, and then determine which treatments and therapies will give patients the best possible outcome. Still early in his career, Radovich has already reported findings that are likely to upend the way breast cancer research is conducted. His groundbreaking discovery that breast tissue taken from healthy patients serves as a better control than adjacent normal tissue from the cancer patient is challenging conventional wisdom in the cancer community. That critical finding, just one of many coming out of his lab, was powered by QIAGEN’s Ingenuity Pathway Analysis (IPA) tool. “For so many years, IPA has been the go-to tool for network analysis,” Radovich says. “We primarily use it to do pathway, network, and upstream regulator analysis.” More recently, Radovich and his team have begun to use Ingenuity Variant Analysis as well, and will soon be launching studies designed to take advantage of both applications. The passion for genomics came early to Radovich, who became immersed in the field by the time he was working on his PhD with his mentor, a breast oncologist. To help this group of people, Radovich and his team use next-gen sequencing and RNA-seq to understand patient prognosis and response to therapies, predict toxicities or side effects to chemotherapy and targeted agents, and discover promising new drug targets. Recently, Radovich and his lab performed the first-ever comparison of true normal breast tissue, or ductal epithelium, to adjacent normal tissue, or samples of supposedly unaffected breast tissue collected 2 centimeters away from the triple-negative tumor. Adjacent normal tissue is currently the most commonly used control against which to compare the tumor sample and determine genetic changes that have arisen. 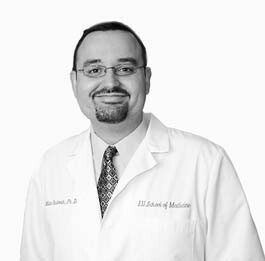 Thanks to Indiana University’s Susan G. Komen for the Cure Tissue Bank, Radovich had access to high-quality samples for this study. They provided a solid foundation for his research, which led to surprising results. According to the comparison, adjacent tissue isn’t as normal as scientists thought. “It’s actually highly influenced by secretions from the tumor,” Radovich says. At Indiana University, Milan Radovich uses Ingenuity Pathway Analysis from QIAGEN to analyze breast cancer networks based on RNA-seq data. So far, his results promise to improve studies of genetic changes in tumors and may lead to new treatment options for triple-negative patients — and he’s just getting started. Based on these remarkable findings, the Komen tissue bank changed its recommendations for researchers in the field; scientists are now alerted that Komen advises using healthy tissues from its biobank as controls instead of adjacent normal samples. As part of this study, Radovich and his team made real strides toward identifying genetic elements that are common across the various types of cancer bundled into the triple-negative group. “Out of 14,000 or so expressed genes, we were able to find with Ingenuity about 146 that acted as the common denominator — and a large proportion of them belong to a single network,” he says. With this new information, his lab is now moving ahead with mouse testing of drug targets that might influence that network. IPA has played a pivotal role in these studies, says Radovich, who uses several bioinformatics tools, many of them developed at universities. “A company can invest in people who can really debug software and commit to quality control,” he says. “What you’re really buying with IPA is a high-quality database and a really well done tool that gives you faster time to results. You’ve got the confidence that the information it generates is right.” IPA features such as Upstream Regulator Analysis, Causal Network Analysis, and Molecular Activity Predictor go well beyond what publicly available tools can offer, he adds. His lab has begun to use Variant Analysis as well, which Radovich says is “better than any other variant annotation tool I’ve used.” The team currently uses the Ingenuity tools separately, but is planning projects that would take advantage of both. Ultimately, Radovich has deployed these tools because he knows they can get him closer to his real goal: helping the breast cancer community that has embraced him and his research team. The photos of patients and advocates around his office remind him and his lab colleagues that these are real people who need real solutions.